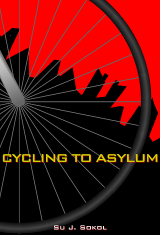 Cycling to Asylum is launched! Thank you Montréal and New York for your support in launching my debut novel! I have also enjoyed being interviewed at my events, online and on the radio. Here is a link to Dyane Forde’s interview of me for her blog, Dropped Pebbles. Here is a link to the interview on CKUT radio. In Montréal, the book is available at Librarie Paragraphe Books, Librarie Drawn & Quarterly Bookstore, Argo Bookshop and Coop La Maison Verte. In New York, Cycling to Asylum can be purchased at The Community Bookstore. Libraries and bookstores can also order the book from Red Tuque Books, the distributer. I will be reading at the Yellow Door Poetry and Prose Reading on Thursday, August 28th at 7pm,3625 Aylmer, Montreal, producer/host Ilona Martonfi. A reading and book signing followed by a discussion of cycling as transportation will be held at Coop La Maison Verte, 5785 Sherbrooke, Ouest, on Thursday evening, September 11th, at 7pm. I will also be doing two events in Toronto in September, on the 21st and the 23rd, during the Word on the Street festival. More information to follow!